First of all, this app is not what you’d call 100% a book or 100% an app, it’s a mix of the two – an interactive book. This type of book is a relatively new concept and I wouldn’t mind betting that in the future, the trend for interactive books will start to challenge sales of ordinary books. Just why do I think this? Well, using one of Touchzing’s interactive books is a refreshing and rich experience. Just opening this app/book up straight away hooks me into wanting to find out more about Gandhi. 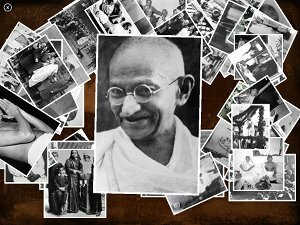 A short introductory video plays in the opening showing pictures of Gandhi at different stages in his life. This was quite interesting for me because I’ve only ever seen pictures and footage of Gandhi in his later years. The intro starts off by hinting that Gandhi has affected the lives of millions, using non-violent ways to achieve freedom for the people. In this app there is an interactive biography, a photo gallery, a quotes slideshow and a video gallery. In the interactive biography, this app/book first gives us a general introduction as to Gandhi’s role in India’s struggle for freedom. The textual intro I found also had a quote which I’ve committed to memory by Gandhi, which was this quote . . .
You can also watch a short summary of Mahatma Gandhi’s life on a video that is linked to the text intro. Here then is the beauty of interactive books, in that you can link many types of media together to give a deeper and richer experience than just a plain book. The intro sets us up for looking at Gandhi’s life in more detail, such as Gandhi’s childhood, his education in England, his links with South Africa and his eventual return to India. I love the picture section which you can see a screenshot of on the left here. You can drag around pictures and resize them by pinching inward or outward. It really does feel like you have a bunch of pictures to shuffle around with on a desktop. You can even view a list of videos within the app to specifically watch a chosen video. Happiness is when what you think , what you say and what you do are in harmony. Mahatma Gandhi was born in 1869 with the name Mohandas Gandhi to a well rounded family who worked hard, and had a profound faith to the religion of Hinduism. He was first called Mahatma, meaning high souled in Sanskrit, in South Africa around 1914. In India he is also know as Bapu, meaning father. Gandhi’s name became famous due to his life long sojourn to employ non-violent civil disobedience for the goal of freedom and that he was a leader in India’s break away from British rule. His life was fairly ordinary in most peoples eyes, aside from being quite shy and having an arranged marriage at the young age of 13. Gandhi’s mother and father died when Gandhi was young. He struggled with school work, yet was accepted to study law at the University of the College of London. Between 1888-1900, Gandhi and his wife, Kasturba, had four sons. After finishing school in London Gandhi tried to be a lawyer in Bombay, however he wasn’t successful and was instead hired as a lawyer in South Africa. During his 21 year stay, Gandhi gained profound public speaking, negotiation, leadership, and political skills. Even through his discriminatory encounters and violent traumas, Gandhi never set aside his most prized value of non-violent action to bring about change in not only people, but entire countries. After learning much about India from Indians in South Africa and having an outside perspective on his homeland, Gandhi finally returned. His permanent return was in 1914 and shortly after he joined the Indian National Congress to address the country’s pressing issues. In only 6 years he became the leader of Congress and demanded independence. Even through consistent disagreement toward Britain and an imprisionment, Gandhi persisted until India was officially declared independent in 1947. Only one year later Gandhi was sadly and violently assassinated, by a man named Nathuram Godseon, on his way to address a prayer meeting. Gandhi not only brought about India’s independence from British rule, but also encouraged change in equal rights for women, action against poverty, and to join the separated states of India into one. All of this was carried out without violence and that is the pivotal reason why Gandhi’s name is so well known worldwide. He was a peaceful yet powerful leader who brought about positive change in an ever growing volatile world. I can’t fault this app book as there are so many features and so much information included. I’m still reading through the information right now and enjoying every moment. The app is well put together and is fun to read and explore related multimedia. If you want to learn about the life of Gandhi, then this is the only app book you’ll ever need to enrich your soul by immersing yourself in a Gandhi’s Â life story, someone who is full of kindness and love. Mahatma Gandhi Interactive Biography is a joy to read.